Whereas bottom-up systems biology relies primarily on parametric mathematical models, which try to infer the system behavior from a priori specified mechanisms, top-down systems biology typically applies nonparametric techniques for system identification based on extensive “omics” data sets. Merging bottom-up and top-down into middle-out strategies is confronted with the challenge of handling and integrating the two types of models efficiently. Hybrid semiparametric models are natural candidates since they combine parametric and nonparametric structures in the same model structure. They enable to blend mechanistic knowledge and data-based identification methods into models with improved performance and broader scope. 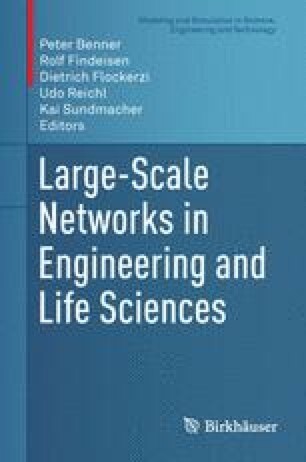 This chapter aims at giving an overview on theoretical fundaments of hybrid modeling for middle-out systems biology and to provide practical examples of applications, which include hybrid metabolic flux analysis on ill-defined metabolic networks, hybrid dynamic models with unknown reaction kinetics, and hybrid dynamic models of biochemical systems with intrinsic time delays. The authors M. von Stosch and N. Carinhas acknowledge financial support by the Fundação para a Ciência e a Tecnologia (Ref. : SFRH/BPD/84573 and SFRH/BPD/80514).